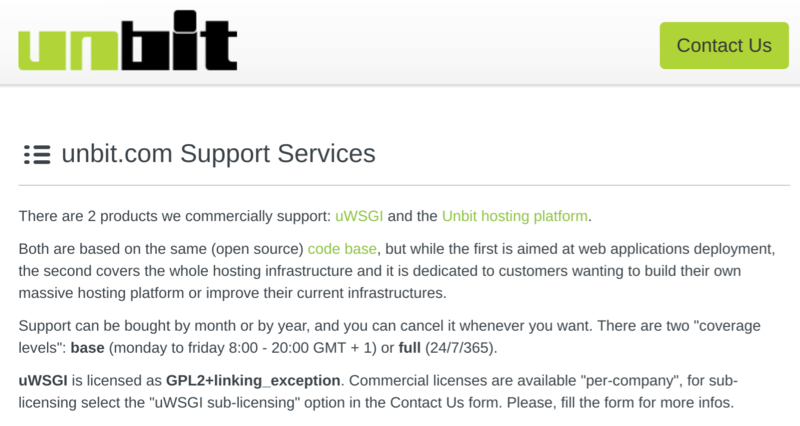 UnBit Review 2019: Is UnBit a Good Hosting? Unbit offers a highly specialized Linux container hosting platform for software developers. This service is not suitable for beginner webmasters. Unbit’s hosting services are designed specifically for software developers who want a platform to host their applications. It is based on the company’s uwsgi.it technology that combines Linux containers with the uWSGI multi-language application server. If you don’t know what this means, you should look away now. This vendor’s very technical website is in Italian. 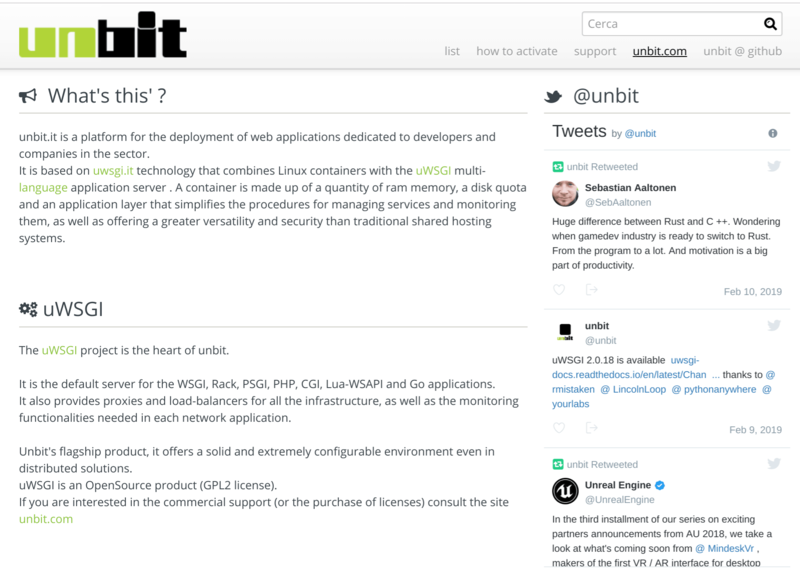 Unbit’s hosting is based on Linux containers comprised of an amount of RAM, a disk quota, and an application layer that simplifies the management and monitoring of services. This offers greater versatility and security than traditional shared hosting systems. This completely open source hosting solution is configured via a simple HTTP / REST API that is also fronted by an HTML5 console which you can log into. You can choose the data center on which to activate your hosted container, and you can create high reliability or disaster recovery systems with a few lines of configuration. Containers can send alarms through channels such as Slack and Jabber when resources require attention. If you have your own hardware or dedicated servers, Unbit’s staff can configure your systems as nodes of the uwsgi.it infrastructure and can manage them for you. Listino uwsgi.it: ranging from 1 GB memory / 10 GB disk space / 2 TB traffic up to 8 GB memory / 80 GB disk space / 2 TB traffic. Listino uwsgi.it FULL server: ranging from 30 GB memory / 3800 GB disk space / 30 TB traffic up to 60 GB memory / 3800 GB disk space / 30 TB traffic. This very specialist application hosting comes at a high cost compared with traditional website hosting and does not include the costs of a domain name and SSL certificate. You can purchase the plans on an annual or monthly basis, with an annual commitment effectively giving you 12 months for the price of 10. Unbit’s email assistance is available for twelve hours each weekday and six hours on a Saturday, or by telephone “in an emergency.” You can sign up to an SLA for more support, and it looks like you can also obtain paid-for 24/7/365 support via the sister site at unbit.com that also provides a contact form. Unbit has almost 300 open source developer followers on GitHub, who will no doubt understand and appreciate its particular kind of hosting, and maybe even contribute code to it. Tony Loton has been a prolific writer and editor of business, technology and finance books, magazine articles, and corporate content for longer than he cares to say. It's a vocation, not a job! Wondering how UnBit stacks up against other Web Hosting companies? Enter any other Web Hosting company and we will give you a side-by-side comparison.